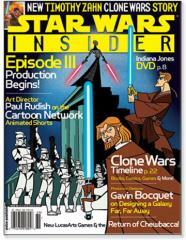 #69 "Clone Wars Timeline, Return of Chewbacca"
In Star Wars Insider #69, the official magazine of the Star Wars Fan Club, Art Director Paul Rudish talks about his work on the upcoming animated Clone Wars series, his first exposure to Star Wars as kid and why droids have a special place in his heart. Also in this issue is a Clone Wars EU timeline, a profile on Production Designer Gavin Bocquet, an interview with Star Wars parody songster Weird Al Yankovic and a new Clone Wars tale from Timothy Zahn called "Hero's Rise." Plus Steve Sansweet and Boba Fett actor Jeremy Bulloch compare their memorabilia collections while gaming fans get an update on the long-anticipated Star Wars Galaxies. Regular features like Rick McCallum's Prequel Update, Holonet News, Behind the Magic, and letters from the fans in the Rebel Rumblings forum complete the issue.